I wonder if there is a word, other than bewilderment, for the reaction to a writer who receives praise despite mediocre work. This is what Patrick Marber’s writing stokes inside me. 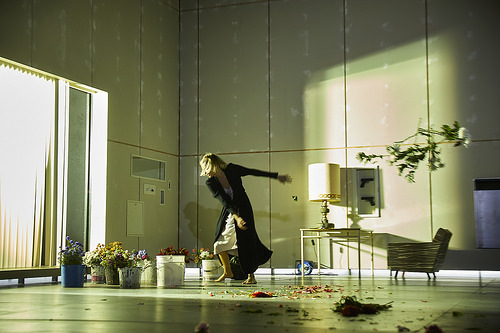 His re-writing of Henrik Ibsen’s Hedda Gabler is by far the most lamentable element of this National Theatre production, which sometimes glistens with sparkling elements, but includes far too many misjudgments at the head-in-hands level . To name a few: Leonard Cohen’s lovely yet done-to-death “Hallelujah” plays over a somber transition. Pale blue lights shine intermittently on the assembled actors, for no apparent reason. Physicality is dishearteningly overplayed at times, making the performers appear more like wet marionettes than characters telling a story. And yet, Marber’s script outdoes them all. The play concerns itself with a day and a night in the apartment of academic wet blanket Tesman and the eponymous Hedda, his new, unfulfilled wife. Friends and former lovers of theirs come and go to moan and wail about their various woes, from dead-end marriages to unrequited love to jealousy over academic rivals’ successes. There are intriguing elements to these episodic entrances and exits, most compellingly when Tesman’s semi-rival Lovborg lays out his plan for his next work. This is what most frustrates about this show: there are so many glimmers of intriguing theatre, many stemming from Ivo Van Hove’s smart (yet here unexceptional) direction, but they are all but snuffed out by Marber’s tone-deaf phrasing and (I hazard) self-importance. Hedda, a groundbreaking and fresh character in 1891, is nowadays much less extraordinary. She is the daughter of a prestigious general, and a young woman with many suitors, yet lacks any real goals or interests in life. This “poverty of spirit” as the play decides to call it, leads her to seek out increasingly sadistic means of exerting some kind of power over something, whether it be tearing up flowers or firing her father’s pistols at unsuspecting guests, and eventually much worse. This kind of bourgeois-fetishizing story creates just the sort of middle-of-the-road tension and intrigue that should be right up Marber’s alley. Is Tesman going to get his professorship? Is Hedda fulfilled? What is that maid doing there? Yet Marber seems to think he doesn’t need to convince an audience to care about these central questions of the script. So he fails to. Much like in his magnum opus, Closer, Marber’s word choices can prove unfortunate and even unpleasant. The storyline is treated with such carelessness that it is unclear whether it is satirizing its own pomposity or reveling in it. It looks like Ibsen’s text has suffered a form of quantitative easing and the original is struggling to get back into shape. Certain big monologues (that strain the runtime for no apparent reason) are answered by brief ironic retort: when one character loses the precious, handwritten single draft of his upcoming masterpiece, he waxes poetic for no less than five minutes about his loss — to which another character quietly quips: “It’s just a book.” Somehow, this self-awareness gets squashed and replaced with showiness and shiny things. There are many shiny things. The set is the unfurnished apartment owned by Hedda and Tesman and is immaculately underdressed. Hedda’s costume is a shiny nightgown. The lights gleaming out of an impressive side window are shiny, as is the display Hedda creates as she plays with the blinds out of increasingly aggressive boredom. The two handguns on show in their upstage glass case are shiny, and even shinier when they are — spoiler alert — fired at certain characters. But shiny objects do not tell good stories by themselves. We seem to have a production that thinks having a smooth set and glossy production values can make up for a certain percentage of the narrative. They cannot. Some more work on character dynamics and relationships and a little less time stapling roses to walls would have helped quite a lot. That being said, there is still much to be appreciated in the production. For their stamina alone, the actors deserve some credit. Wading through these lines with such patience must have been hard. Lead actress Lizzy Watts gives Hedda some delightfully cruel ticks, from turning her back on anyone she finds unworthy, to consciously tormenting her guests with their worst vices. Her dynamic with Richard Pyros, playing Lovborg, was the most electric to watch, especially as she toys with his teetotalism in the most vicious way. Adam Best as corrupt judge Brack is the most bombastic onstage presence by far, and his was a refreshing performance. Annabel Bates is good at looking sad, that’s for sure. Abhin Galeya waves his hands around far too much, but otherwise is a solid Tesman — though the character seemed meant to be much more pathetic than the relatively proud man Galeya has created. Christine Kavanagh is a charming red herring at the beginning, as her Aunt Juliana character deftly introduces the audience to the show, then disappears — which is a shame, as Kavanagh’s energy was possibly the best-measured. Madlena Nedeva is a solemn and well-crafted presence as Berte, the maid, yet her character is so untapped that she quite literally becomes more a piece of furniture than a participant. Overall, an underwhelming and overwritten production of an important play. It is surprising and disappointing that others have eaten it up nonetheless. 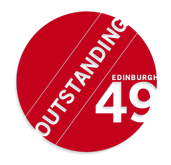 Go to Edinburgh49‘s Festival Theatre archive.